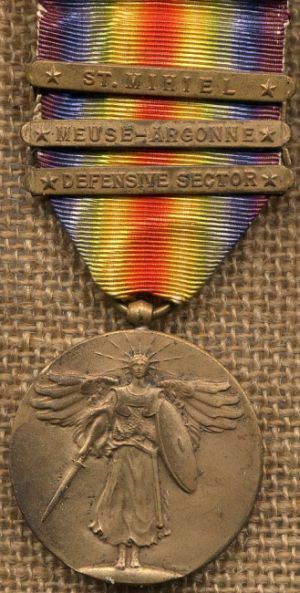 The American Victory medal (Army) had 14 clasps for actions in which the AEF participated. A „Defensive Sector“ clasp was issued for any fighting not covered by the battle clasps. In some cases it is possible to tell which division the awardee of a Victory medal belonged to by studying the clasp combination. It must also be remembered that a medal in a group to a soldier from a specific division can in fact be missing a bar or two if the man was wounded and was out of action for a period. 1)The battles of detached US Divisions/Units: These took place mainly before the establishment of the 1st Army but also continued after its formation as US Divisions reinforced the French and British war efforts. The texts are based on official US army histories and should help the collector understand the actions the battle bars were awarded for. 1) Cambrai, 20 November - 4 December 1917. 2) Somme Defensive, 21 March - 6 April 1918. 3) Lys, 9 - 27 April 1918. 4) Aisne, 27 May - 5 June 1918. 6) Champagne-Marne, 15 - 18 July 1918. 7) Aisne-Marne, 18 July - 6 August 1918. 9) Somme Offensive, 8 August - 11 November 1918. 10) Oise-Aisne, 18 August - 11 November 1918. 11) Ypres-Lys 19 August - 11 November 1918. 12) Vittorio Veneto, 24 October - 4 November 1918. 2) After the formation of the 1st Army Pershing pushed for independant action. The first major US action was the reduction of the pocket at St. Mihiel. The Meuse-Argonne was the campaign in which the AEF came into its own, an advance on the west bank of the Maas. 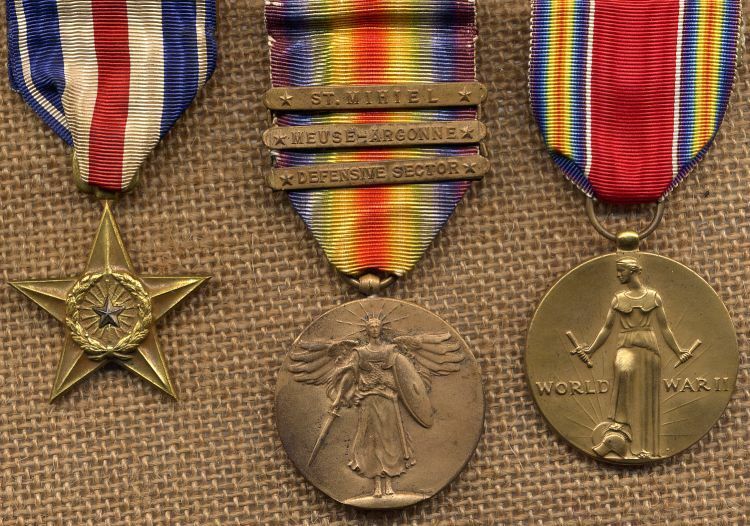 Above: The medal group of Private John A. Byron, 7th Engineers, 5th US I.D.